David Scott's mission to the moon focused on science and featured the first lunar road trip. 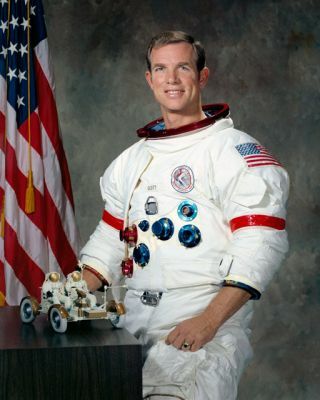 David Scott flew in space three times, including one mission to the moon. He survived a harrowing spin aboard Gemini 8, piloted the command module on Apollo 9 for the first docking of the command module and the lunar module, and later drove the lunar rover for the first time on the moon's surface during the Apollo 15 mission. Scott's skills as a pilot and scientist ranked high at NASA, earning him accolades to this day. After Apollo 15, he remained with NASA to play an important role in co-operating with the Russians as the Cold War cooled. Scott's career started in the Air Force, for which he did a tour of duty in the Netherlands. He also studied at the Massachusetts Institute of Technology. His selection by NASA in 1963 was in part a process to weed out those candidates who were unduly fearful, he said in an interview. "It’s like a good New York Giants football team, right? They all depend on everybody else and they know the plays. There is no fear involved, but there is concern about how things are going to come out — and how you take care of problems," Scott said in an Ask Men interview decades later. Scott's reaction to fear was well-tested during Gemini 8. The spacecraft's thruster got stuck open, whipping the spacecraft around at a dizzying and dangerous rate. Scott's crewmate and commander, Neil Armstrong, had to turn on the re-entry thrusters to get the spacecraft under control. That ended Gemini 8 early, but it marked both astronauts as worthy people to be assigned to future flights. Scott flew again on Apollo 9, which featured the first docking between the command module (with Scott at the controls) and the lunar module. Scott's last flight, Apollo 15, was one in which he vowed to put science first. The astronauts would have three spacewalks on the moon's surface, and he wanted to make the most of that time. Scott and his crew — Al Worden and Jim Irwin — did hundreds of hours of geology training in preparation for their mission. The commander's first major act after landing was to do a site survey, in the tradition of geologists everywhere. Scott popped his head through the top of Falcon, the lunar module, to do a panoramic site survey and to describe the scene to a geology team assembled in Houston. Scott and Irwin kept busy during their time on the surface. They tested out the lunar rover for the first time, driving it 17.5 miles (28 kilometers). This allowed them to do geology farther afield than previous missions. The crew ended up finding one of the most famous rocks of the Apollo program — the Genesis Rock. About 4.5 billion years old, the rock came from about the time the moon was beginning to coalesce. In 2013, traces of chemical water were found in that rock, hinting that the moon's crust may have been much wetter than believed. Astronaut James B. Irwin, lunar module pilot, works at the Lunar Roving Vehicle during the first Apollo 15 lunar surface extravehicular activity at the Hadley-Apennine landing site. After Apollo 15's successful return, NASA opened an investigation into the conduct of its crew as well as that of several other astronauts. The issue was the crew's decision to fly 398 unauthorized first-stamp covers to the moon on behalf of a private collector, as well as timepieces. "It is the contention of the astronauts that there was to be no commercialization or advertising of these covers, and that nothing would be done with them until after completion of the Apollo program," NASA wrote in a 1972 press release concerning the incident. The astronauts, stated NASA, initially agreed to receive savings accounts, but later rejected the idea. Scott also flew two timepieces without authorization for a company that wanted to test them in space. Scott and his crew were formally reprimanded for their actions, and several other astronauts were also revealed to be caught up in the stamp affair and punished. "Years later, Scott would blame his bad judgment on the pressures of getting ready for a lunar landing mission," wrote Andrew Chaikin in his 1994 book "A Man on the Moon," which chronicled the Apollo program. "We made a few more changes for future flights," wrote Chris Kraft, a past NASA manager and flight director, in his memoir "Flight: My Life in Mission Control." "Everything in an astronaut's personal pack had to be listed, sealed, then signed off ... finally I insisted that each astronaut sign an agreement: They could give away items from those personal packs, but they couldn't sell them." Scott did not fly again, but he remained in NASA for six years in management positions. He was special assistant for mission operations for the Apollo-Soyuz Test Project, which brought American and Russian vehicles together in space for the first time. Later, Scott took on several private industry positions and served as an adviser for the movie "Apollo 13." In 2004, he and cosmonaut Alexei Leonov co-authored "Two Sides Of The Moon," a look at the space race from both sides of the Cold War.